I saw this on another forum and am curious what DF members think about gaurantees. If you are a breeder, what kind of guarantees do you use or consider reasonable? If you are someone who gets a puppy from a breeder, what would you expect as far as guarantees go? Contracts and health guarantees can be a good thing, but they can also be overdone to extremes. A dog is a living breathing entity and there isn’t a contract or guarantee ever written that can cover every possibility. The best protection an owner can have is to choose their breed and their breeder carefully and establish a trusting relationship long before purchasing a puppy. It's the breeders responsibility to educate new puppy owners and it's the owners responsibility to learn and understand the dog's needs. The best protection a breeder can have is to choose their puppy purchasers carefully and make the effort to stay in touch with them constantly. A truly caring breeder and educated owners will be more beneficial to both pup and owner than the most detailed contract in the world could ever be. I'm a firm believer in health testing of the parents and careful selection of the breeding pair; but I'm not at all sure I agree with a long term health guarantee. There are too many variables to consider such as environment, food, exercise, and even training methods that can effect a dog's overall health. Even human babies don't come with health guarantees! Added to edit: With so many unscrupulous breeders selling puppies, (such as pet shops, and online puppy brokers), a guarantee is only as good as the paper it's written on. Every day there are stories of awesome, well written guarantees that have proven to be unenforceable. Most pet owners don't have the ready cash laying around to take the breeder to court if they refuse to stand behind their guarantees. Know your breeder! Last edited by applesmom; 12-28-2007 at 01:50 PM.. I believe every ethicial breeder should give the OFA two year Hip n Elbow warranty for a replacement of better or equal quality puppy if hips do not rate an A or B.
I also give a year warranty on the puppy of a disease or illness that would effect the lifetime of the puppy. For replacement of. I feel that is all I can offer at the prices I sell for as when I import I get NO warrantys be European Breeders, just the chance you take. I have gottan Hip Displasia in one male through all I have bought and the Breeder did replace my pup, but she did not have to. I do not feel you can offer on heart, eyes, thyroid, etc unless your getting 3 grand or more for a pup. I stay in contact and know most all my hundreds of pups sold are doing fine, a couple got onto a road by mistake. Keeping in contact does not only keep a good relationship but it does not cover any warrantys. U just know the pup they bought is fine and they are most happy. Of course I restrict my papers on all puppies at the price I seel them for, as they are to be family member pets, they can do whatever in work filed they want of course. I answer all emails and calls to hear how happy they are etc. It keeps me pretty busy also. Good breedes makes decisions on litters a year ahead as I have for 08, planned and I am looking now for a female as Sasha is sold to retire her final years out. I try to buy for bloodlines that are updated as they do go out of style so to speak so buying never ends when a good Breeder wants to offer the best of the best. It is constant looking at new trends winning and the older lines fading back in pedigrees, costly, yes, but I have to do this to offer updated blood lines winning and working with what I have to cross with. It takes more than one female but at least 4 breeders or more to stagger litters and I am going to send one female out for breeding to get some new lines, so it is just a constant read and study to see if I like what it to offer me and what is winning, If I like the lines or not to cross with what I have. I truly think warrantys are necessary then I have a breeders-buyers contract I make up myself totally different than a warranty of two I give. I also give them instructions how to raise a puppy along with the Incrediable puppy video to watch and I insist on supplements, good food and educate them before leaving with their folder full of information. I also agree that a lifetime guarantee of genetic health issues is extreme. I understand when I get a puppy that it might develop a disease years down the road that could be related to genes. While I do expect my dog to be healthy from genetic issues as a young dog, I don't expect it with a senior dog. As far as guarentees of performance (in any event...herding, conformation, agility, obedience, etc. ), I would so steer clear of anyone making a "guarantee" of such. They can say what they strongly feel the pup will turn into, but environment will play a much larger role than genes in the final determination of performance success. IMO it would depend on the situation and what the dog was initially bred to do. Speaking from the field trial and show standpoint; if I were looking for a serious competition dog, I would not sign a contract stating that the dog could not be sold or placed by me at my own discretion. No one can possibly guarantee how that pup is going to turn out. If it didn't turn out to be a field trial competitor and/or show prospect it would still be a completely trained hunting dog. To expect it to be turned over to the breeder free of charge would be ridiculous. At the time the decision is made whether or not the dog would be competitive, the owner has literally invested hundreds of hours and possibly even thousands of dollars, not to mention the emotional ties that have developed. They know that dog inside and out and if they couldn’t keep that dog they would be a lot better qualified to place that dog in the perfect home than the breeder would. The owner would also have every right to expect to recoup some of the money and effort they'd invested in that dog by placing it in an excellent hunting home! If the buyer could no longer keep the dog due to unforeseen circumstances, it should go back to the breeder rather than to a shelter or just carelessly being given away. This is just one example of how a return contract can't cover every situation. As far as breeding rights goes; if I'm an experienced competitor and breeder and I purchase a pup for competition, I would also insist on full breeding rights. There are many reasons that dogs that could be great producers are never able to gain the desired titles. To eliminate an otherwise great dog from a breeding program simply because the owner ran out of money or the dog was injured prior to achieving the desired titles could do an injustice to the breed. While contracts can be beneficial to both parties, in some cases the expectations are too high on both sides of the issue. For pet quality I can see the necessity for a spay neuter agreement, limited health guarantee, and mandatory return to breeder if the owners only alternative is a shelter or rescue if the owner can't keep it. But we're not talking $25.00 street corner dogs here. Most owners who've gone to the trouble to purchase from a reputable breeder will act responsibly if their circumstances change and they must find the dog a new home. Quite often these dogs are placed in great homes with other family members where they are better off than they would be going back to the breeder. However the breeder should always be willing to take the dog back rather than allow it to become a statistic. 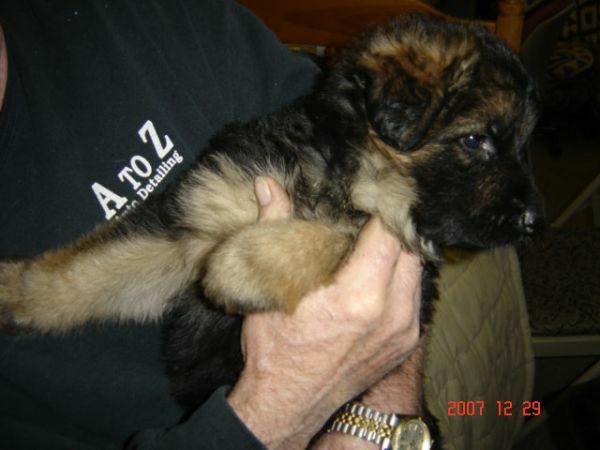 Last edited by applesmom; 12-28-2007 at 04:18 PM..
Know what your saying as an Ohio Breeder owes me $400 and will not apply it to a puppy not that I want another, nor stud fee which is East lines. If we had not stopped payment on last two checks it would be lot more money. Big web site full of lies and info that means nothing. I do not understand why a Breeder would go to the trouble to draw up a contract and not follow what he/she signs and gives a copy and keeps one?? Makes me sick this is why I have gone across pond, a risk but at least I know I am getting better lines and not being stung. All Have been very kind people in Germany and worry if the pup is well and writes me alot most all of them. Did not expect that however. But, if they also advertise in papers like I have heard, I made the big mistake back some years now not to ask for references, but then they can also lie.?? One really cannot win in buying unless you truly know the Breeder well. The big web site and advertising in the paper cause large litters they could not sell, made me sick. They knew we would not take time to go 8 hour drive for that amount also.? In my puppy contracts I garrenteed for hips and elbows all the puppies to OFA standards of either Excellent, Good or Fair by 25 months. All the puppy adpoters have agreed to OFA the pups when they turn 24 months old so I will be lucky because I will get to know what the whole litter will have in the way of hip scores. Amidst the confusion of the times, the conflicts of conscience, and the turmoil of daily living, an abiding faith becomes an anchor to our lives. Sheplovr--some breeders make up fantastic contracts that will impress first time buyers and have no intention of following through...but it sells pups so why not? Before buying I always made sure the parents were titled in some field. I was interested in obedience so I looked for breeders who worked their dogs in obedience. If the breeder didn't bother to put titles on both parents I looked elsewhere. To me, titling your breeding stock proves a breeder is trying to produce great puppies. If someone is only breeding for the sake of $$$ it shows right away. I also never would look on line for a breeder, if someone has to advertise on all wesites available it shows the breeder's reputation hasn't been proven. I always insist on references from satisfied customers and I would always follow through.The last breeder that my present dogs come from guarantees them for life. She will take any pup back for any reason and return your money or replace the pup, my choice. Should the ears fail to stand, this is also guaranteed. If for some reason you end up displeased with the temperament the pup will be replaced or money returned, no questions asked. If a dog ends up with a gay tail this is also guaranteed. In other words she wants happy, satisfied customers and will go that extra mile. She does make you sign a spay/neuter contract if you are buying pet quality as she sells these for less. If you want to breed the dog, you will pay a higher price but all her dogs are of the highest quality. But the selling feature that I love most is that she is always available to give advice on any problem one might have re: feeding, training, health issues, etc. she herself is an obedience instructor and evaluator for St. john Ambulance, all her own dogs are titled--cgc, cdx, cd etc.She also puts in long hrs working for the kennel club she belongs to. This proves that she truly is interested in her chosen breed and truly wants to improve the breed. Also, she doesn't sell a pup to the first comer, she takes time to evaluate potential future homes, if she gets negative feedback on a potential buyer she won't sell them one of her pups. I understand that and since I buy by importing the parents of my dogs are all V n VA titled of course you would know VA is cream of the crop. I do not title mine I am too old now and I know what parents produce good search n rescue pups, etc. I breed first and foremost for temperment, getting good pups from good breeders in Germany and Netherlands. Of course I raise them properly. I do not ever get a phone call or email that asked anything about titles. In fact Gino does Shutzhund, I used to show off for some people, get the sleeve out and agitator, he scared them to death. I lost a couple sales over doing that stupid things, showing how agressive he attacks the sleeve, holds on then drops kindly, it did not impress who buys from me. So, I do not believe in lifetime warrantys. For one thing how do I know even on the phone if they are truly going to sign my contract, take best of feed, supplements make it a family pet, work it etc. For life, no way am I guaranteeing any puppy nor have I ever seen such a warranty. Two years on hips and one year on illness is sufficient for me to offer as I do not get three grand a pup. Having said that I know a breeder out West that gets $3500 without lifetime warranty. Same as I give only they ship free, they should?? How on earth could any breeder give a lifetime warranty. As much as I trust people and keep in touch I do not know what they are truly doing. I get photos u may of seen of my site, but that is only a few of hundreds of pups I have sold.!!!! To be most truthful much as I have searched not here in U.S., but never saw a lifetime guarantee.!! I answer all questions, give advise very firmly and give a folder full of information to start the puppy, in fact I prekindergarden train them, paper train, so they are started on Sit, come, No, etc. I think I do quite well with Quality Puppies that are working in many fields, I do loose track of some that are busy unless I look up a club site and see. My mentor is Dr Ron that competed in Obedience and bought dogs from Germany Shutz trained and ended up in court a few times over bites severly by his dogs, he bought one from me and he n Kathy are so happy they have a deposit on another is I have enough. 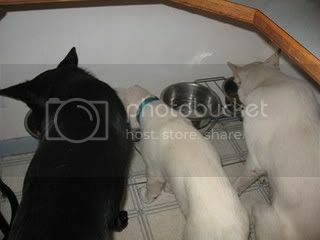 Can many dogs including males eat together like this with absolutley no bickering or fighting, NOT. Look how sweet this lonely pup is getting spoiled but listens well at lil over 4 wks. yup my dogs can. All my dogs eat side by side. They will even share bones together and also allow the cats and ferrets to share their food while they are eating it as well.